Talking about sexting can feel uncomfortable for many parents. 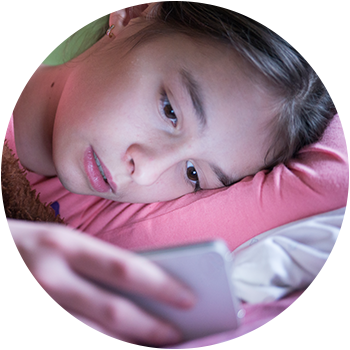 Learn more about what sexting is, its impact on your child and how to talk to them about it. As a parent you might feel left in the dark about sexting and the consequences it can have for your child. What others will think, will they judge me as a parent? You are not alone! Many parents have been where you are now. I’m upset or angry and I feel like I want to punish my child. Talk to Parentline or someone you trust about how you're feeling before talking to your child. How does a parent talk about this with their child? Stay calm and let your child know you want to help and support them. Who can I talk to about this? Parentline is here to support you. Being charged even if they didn’t mean for the image to be distributed or know it’s illegal. The police will take this into consideration and as a parent you can support your child to report the sexting to the police. Parents will get angry with them. Talk to your child calmly about their experience of sexting and let them know you want to help. Parents will take away their phone and internet or limit their access. Reassure your child that talking to you will not mean they have to stop using their phone. Being bullied and shamed at school or in public. As a parent you can support your child to report sexting to the police or on the eSafety website as well as supporting your child to talk to their school or to Kids Helpline about any bullying or harassment. If you’re struggling with a parenting issue like this one, know that you are not alone. Check out the eSafety website for more information on how to support your child and how to report sexting. Or give us a call on 1300 30 1300 (QLD & NT) and speak to one of our trained counsellors.